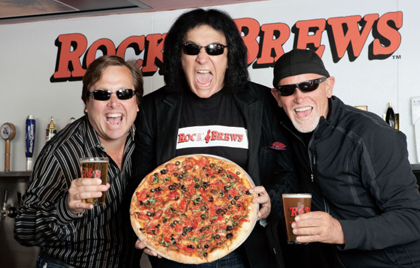 Kiss’ two active original members, Gene Simmons and Paul Stanley, want you to rock ’n’ roll all night, party every day—and how about you nosh on some burgers and wings and try some microbrew from the new international casual dining chain they’re partners in, Rock & Brews. In their trademark makeup, Simmons as “The Demon” and Stanley as “The Starchild” fashion the image of Kiss that’s as recognized—and bankable—as Mickey Mouse and Ronald McDonald. Makes you wonder why I, a beer writer, am hanging out with them in Los Cabos, Mexico, on assignment. They’re hardly connoisseurs. Stanley hardly ever sips it. “My dad has always loved beer,” he says, decked out in a black leather jacket, jeans and shoes that look like zebra hair with rhinestones. “When most people were drinking Rheingold or Schaefer, my dad was getting Kirin, Tuborg, Guinness. My dad used to drink a beer that you put raspberry syrup into.” Whoa! Papa Starchild was clearly drinking a Berliner weisse pre-Renaissance. As such, I asked why they’d sign on as partners in RockBrews. The rock part’s obvious. The décor is a clean congestion of epic album covers and photos—Beatles, Ozzy and here in Mexico nods to artists including Café Tacuba—while TVs screen music videos by Smashing Pumpkins or Rush. Are they even aware of the craft brewing revolution that’s taken place? After all, Destroyer came out the same year as New Albion Brewing. After the 1990s crash, Zislis retired his mash paddle, but his beer passion and acumen persisted. He created Bohemian Brewing and built some 150 systems for other brewers around the world. With Rock & Brews, he gets to support local craft brewers. And with plans to open about 100 locations worldwide, that’s a lot of locals. Many, but not all, of the 52 taps at each restaurant will be craft-brewed. “If somebody wants Bud Light, I’m gonna sell him one,” Zislis says unapologetically. He pays homage “to the classics” among craft and import beers—Sierra Nevada, Dogfish Head and Pilsner Urquell—while tasking each bar director with selecting “what’s happening in area.” The first RockBrews in the LA enclave El Segundo features El Segundo Brewing and Eagle Rock Brewery topping the taps along with Speedway Stout from San Diego’s AleSmith. The Cabo spot only has “24 because they don’t have the same scene we have yet,” explains Zislis, but Baja Brewing’s Pelirroja red ale is excellent with a serious hop kick. Zislis added that he has plans for a keg exchange that’ll bring here beers such as Ballast Point’s Sculpin IPA, which you absolutely won’t find at Sammy Hagar’s Cabo Wabo or the Hard Rock Cafe. RockBrews is in San José del Cabo while Hagar’s and Hard Rock are in the spring break miasma of Cabo San Lucas. They’re only 20 miles apart, but it’s stressed to me that the gap is much wider. This puts RockBrews more in line with chains Flying Saucer or Yard House. “I’d hate to be in the same breath as Hard Rock,” Zislis says. As independent breweries strive to produce just 10 percent of the beer in America, growth needs to come from an untapped audience. There is an army, of sorts, to expose to better beer. As teetotaler Simmons reasons, “Life should give you a menu. I don’t like spinach so I’m not going to order this spinach thing, but that doesn’t mean somebody else shouldn’t have it.” In this way, RockBrews puts craft beer front-row center.